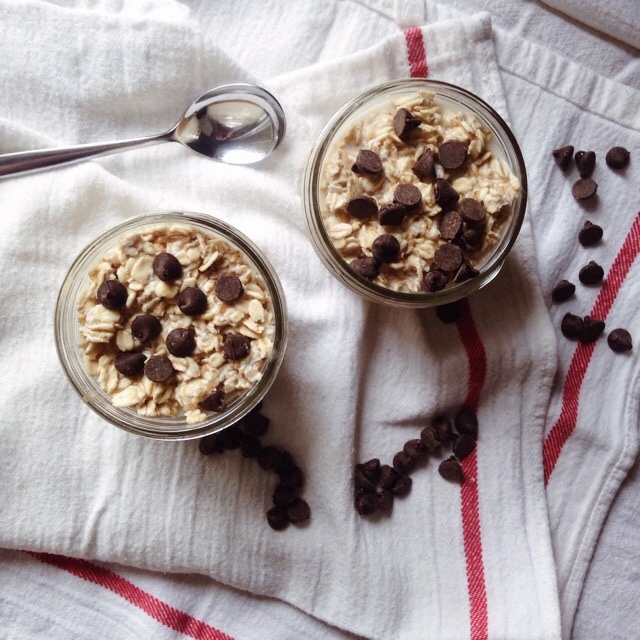 I have been wanting to make these overnight oats for a couple of weeks now, and I finally found the perfect day to make them. I want to let you in on a little secret, I didn't let these oats soak overnight. It took me an hour for soak time, and about 5 to 10 minutes to make the dough portion. I don't like my oats too soggy, so letting them soak for an hour made them perfect for me to eat. I don't know why I have been wanting to make overnight oats for so long, but I have been intrigued by the idea of having breakfast already prepared when I wake up. A big time saver in the morning. So, this recipe was changed up a bit, but derived from Food, Faith & Fitness blog. I love changing up recipes, not because their recipe isn't good, or scrumptious, but I like to do things my own way. I use their recipe as a base. 1. In a small mixing bowl, pour the oats and milk into the bowl until all the oats are covered. 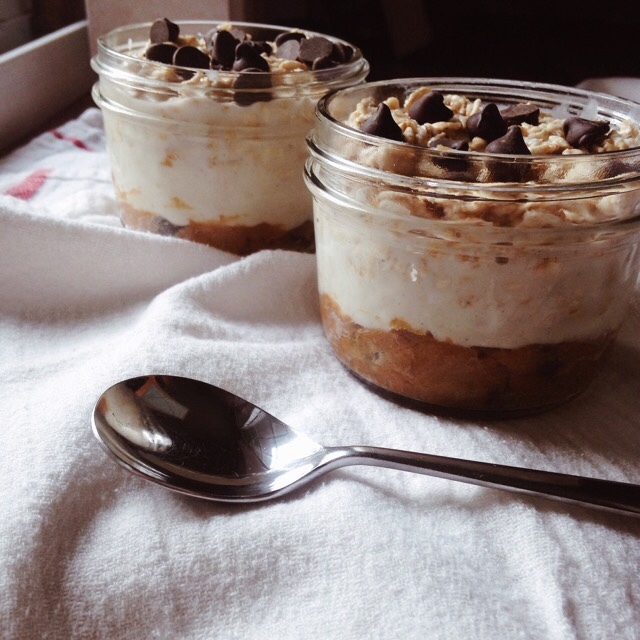 You can use a spoon to dunk some of the oat under so they are covered. Stick the bowl in the fridge for an hour. 2. In a small mixing bowl, scoop the peanut butter and sugar into the bowl. Use a fork and quickly mix the peanut butter and sugar together. 3. Add in the 1 TBSP of vanilla yogurt, and stir that into the peanut butter mixture until it starts to look like dough. 4. Add in the chocolate chips. 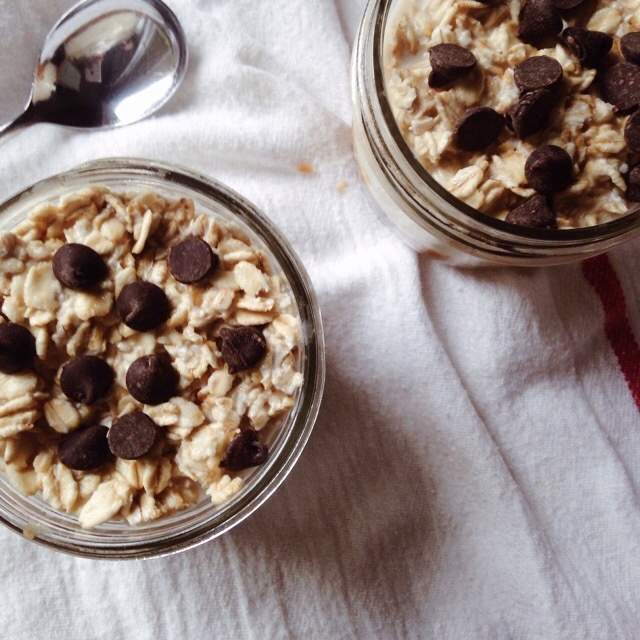 You should only need 2 TBSP of the chocolate chips, and then use the third one to sprinkle on top of the oats. 5. Wait an hour for the oats to soak, then take a jar or a bowl and press the dough portion at the bottom. Take the rest of the yogurt, and pour it on top of the dough portion. 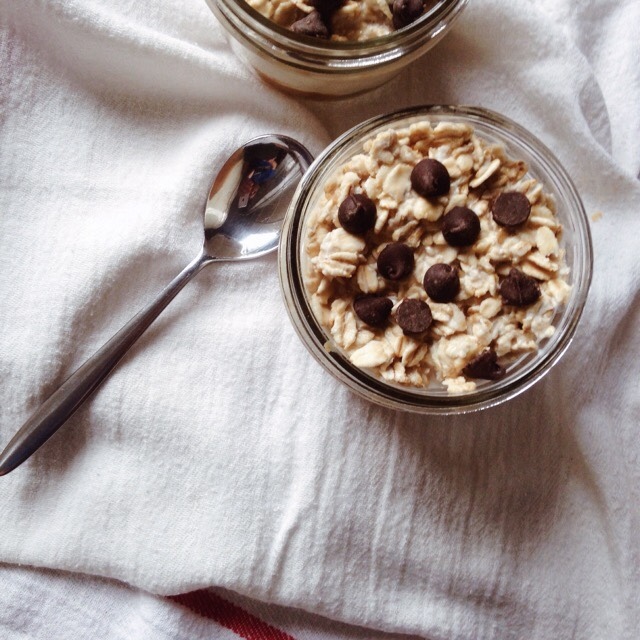 Scoop the oats on top of the yogurt, and sprinkle some chocolate chips on top of the oats. 6. You can split it up into two servings, and viola! 7. You can wait overnight for your oats to soak if you want them a little more soggy. It is such a sweet breakfast! I loved having the layers with almost each bite. The scrumptious dough layer, and the vanilla adding more flavor. It was wonderful. You do not need to sweeten the oats. 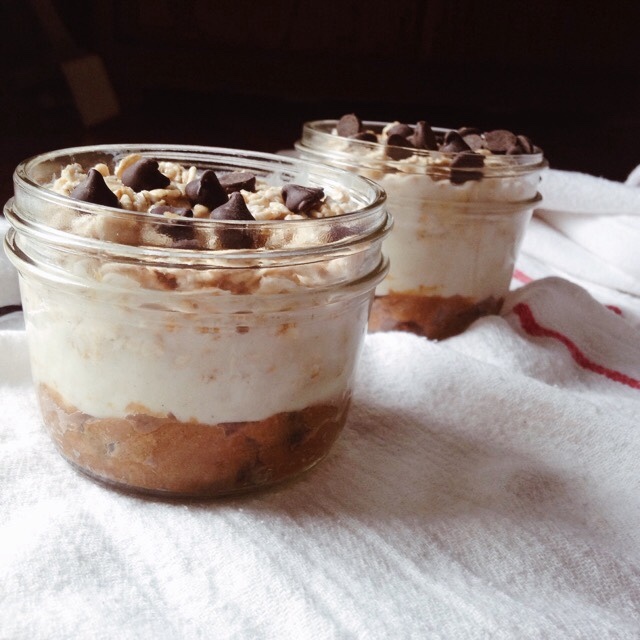 The almond milk gives it a little sweetness, along with the layers in the jar when you eat the layers together. It is actually pretty filling due to the peanut butter and yogurt, the oats take part in that as well. Pair it with a banana, and you have the perfect breakfast. Since I split it up into two servings, I have saved the second serving for tomorrow. I can't wait for breakfast tomorrow!